The Directorate is committed to ensuring all ACT public school students have access to high quality training programs and qualifications that are integrated into senior secondary education, valued by employers and recognised by further education providers. 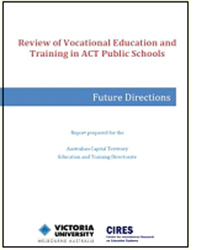 In 2015 the Directorate commissioned a review of VET in ACT public schools, following work all jurisdictions undertook on the National VET Framework, Preparing Secondary Students for Work, and building on achievements the ACT has already made under the National Partnership Agreement on Skills Reform and the Skilled Capital initiative. 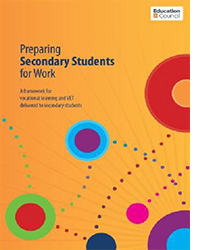 The review was conducted by Victoria University’s Centre for International Research on Education Systems (CIRES) and included the delivery of an evidence based report on the provision of VET in ACT public schools. The Directorate’s response to the report agreed to implement seven future directions for the provision of VET for secondary students in ACT public schools to ensure optimal outcomes for all students. 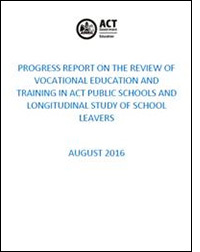 On 4 August 2016, Minister for Education, Shane Rattenbury MLA, tabled a Progress Report on the Review of Vocational Education and Training in ACT Public Schools and Longitudinal Study of School Leavers in the ACT Legislative Assembly. 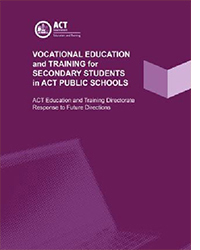 The Report provides an update on the progress of the Directorate’s implementation of reform against future directions outlined in the Review of VET in ACT Public Schools.